Executive Director Retires After 20 Years of Faithful Service. Home > Who We Are > News > Press Releases > Executive Director Retires After 20 Years of Faithful Service. Retiring Mission Executive Director David Treadwell. 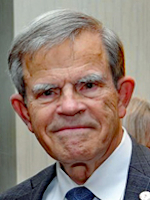 Washington, D.C.—June 21, 2018—On June 27, 2018, Central Union Mission will host an open house in honor of departing Executive Director David Treadwell so that community members, the Missions former program participants, supporters, volunteers and community stake holders can share their well wishes and say goodbye as he retires. Treadwell, whose retirement is official on June 30th, has overseen the 134-year-old emergency rescue shelter since 1998. The Mission expects his successor to be in place by August. Please stop by the Central Union Mission shelter at 65 Massachusetts Ave., NW, on June 27 from 2:00 pm to 6:00 pm to share memories or appreciation or to wish a fond farewell to David Treadwell. He will continue to serve the Mission as director emeritus. If you can’t make it to the open house, please feel welcome to email your good wishes to Mr. Treadwell at socialmedia@missiondc.org. We’ll share your appreciation via our social media platforms during the coming days. You can also make a financial contribution in his honor at missiondc.org. GuideStar awarded Central Union Mission a 2018 Gold Seal for our financial transparency on its GuideStar Nonprofit Profile and GreatNonProfits awarded Central Union Mission a 2018 Top-Rated award.